What’s the Best Performance Chip? What is a Performance Chip and how does it increase MPG, torque and power? What’s the Best Performance Chip? Find out how a performance chip can upgrade your vehicle’s engine. The best performance chips add horsepower to any vehicle, from unassuming daily drivers to 400hp street machines. What is a performance chip, you may ask? The answer is literally in the name. Originally, a performance chip was a little circuit board that had to be mechanically inserted into the control module or soldered into the wiring harness. Once in place, aggressive programming was hardwired into the car’s computer. While modern-day chips have largely been replaced by flash programmers and performance control modules, the term has stuck around and won’t go away anytime soon. Think of “chip” as a nickname for performance tuning accessories that do everything that the old chip did, only vastly improved in every way. Manufacturers want their cars to appeal to the masses. Unfortunately, this involves reducing one great aspect of performance to balance out another, making for a boring driving experience. As it turns out, even performance cars suffer from generic programming. 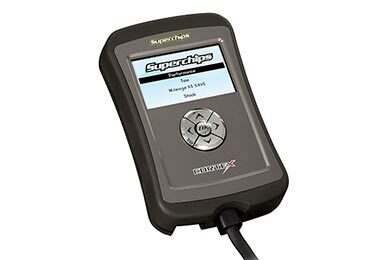 Performance chips retune your vehicle’s onboard computer, with custom programming adding flavor to your ride. Since it doesn’t involve a carburetor and a “tuning” fork, programming a modern car seems weird and mysterious to most shade-tree mechanics. By now, chip manufactures have learned how to bring tuning to the masses. 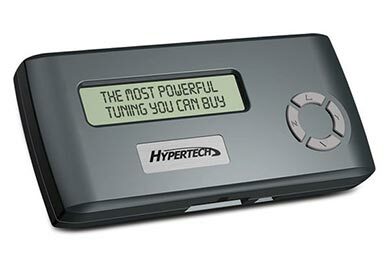 Handheld programmers have simplified tuning to the point that anyone can do it in a few minutes. By connecting to the OBD-II port under your dashboard, a programmer communicates with the computer in the car, which downloads custom software that you select from a menu. Surprisingly, regardless of the brand, every chip works in the same way. Every internal combustion engine needs air, fuel, compression and ignition to function. Performance programs improve the way an engine runs by fine-tuning operating parameters. What does this mean for you? Better horsepower, torque, fuel economy and throttle response. As if that’s not enough, programmers also have additional features that give you control over shift points, tire size correction and top speed limiter settings. What’s the Best Performance Chip for Your Vehicle? While chips are nearly extinct due to the introduction of handheld programmers and control modules, drivers still enjoy the benefits of aftermarket programming. It’s impossible to know the best performance chips for cars, as each has features that may be more desirable, depending on your driving needs. Even though the style of chips has changed, modern programmers and control modules are a chip off the old block. I have had the Hypertech Max Energy program on my Avalanche for about 2 weeks. The difference is unbelievable from a performance and mileage standpoint. Definitely better acceleration. Slight increase in mileage. Only tested the 87 octane program. Who can afford high test in a ’Lanche? Reference # 752-904-674 © 2000-2019 AutoAnything, Inc.